Today we are announcing the release of several updates to Time Series Insights based on customer feedback. Time Series Insights is a fully-managed analytics, storage, and visualization service that makes it simple to explore and analyze billions of IoT events simultaneously. It allows you to visualize and explore time series data streaming into Azure in minutes, all without having to write a single line of code. For more information about the product, pricing, and getting started, please visit the Time Series Insights website. We also offer a free demo environment to experience the product for yourself. 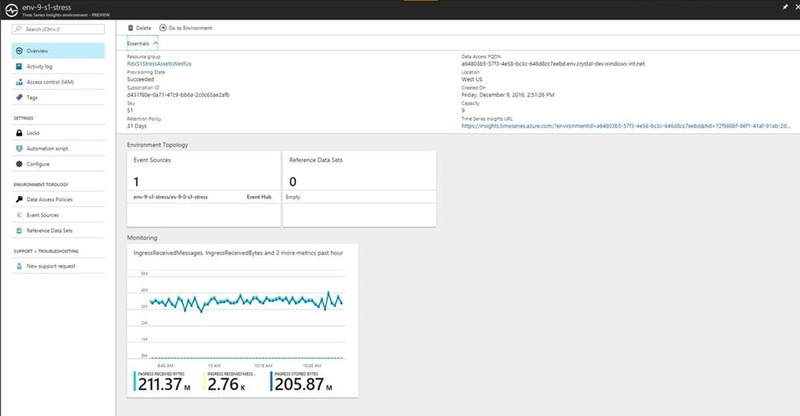 We know that administrators want to plan for and manage their Time Series Insights environments with usage and health telemetry in the Azure portal. To help enable them to do this more effectively, we have added ingress and storage monitoring at the Time Series Insights environment level in the portal. We are also working on adding metric alerts, so you can be automatically informed of critical information related to the status of your environment. We will continue to add additional environment telemetry to the Azure portal in the future – be on the lookout for updates in the coming months. Ingress received messages: Count of messages read from Event hubs and Azure IoT Hubs. Ingress received bytes: Count of raw bytes read from an event source(s). Raw count usually includes the property name and values. Ingress stored bytes: Total size of events stored and available for query. Ingress stored events: Count of flattened events stored and available for query. We’ve also heard feedback from our customers that they need an easier way to augment their device telemetry with device metadata, but without lengthy documentation. Today, we are happy to announce that our new Reference Data API documentation now includes detailed samples showing how to configure, upload and update your reference data programmatically. By importing device metadata as reference data, these customers can tag and add dimensions to their data that make it easier to slice and filter. For customers who are not using our API, we are working hard to deliver a solution built into our UX to allow managing reference data visually to accomplish the same scenario described above. Look for an update to the portal containing this functionality in September. Our customers are building both internal and external applications on top of Time Series Insights for a variety of scenarios. Similarly, Microsoft is also using Time Series Insights internally with innovative services like Microsoft IoT Central and Azure IoT’s Connected Factory PCS. One of the common asks in this area is to be able to use the query API to search relative time spans, like 'now, minus one minute,' avoiding the need to reset the search span with every query execution to ensure you are viewing your most recent data. With this service update, we are improving search span functionality to allow you to define and run repeatable queries over your most recent data with a single query template. With dynamic search spans, we have added a “utcNow,” function that returns the current UTC time. We have also added “timeSpan” literals to allow you to define a period of time, in addition to a “sub” function that allows you to subtract time from datetime values. For more information, visit our query syntax documentation page. Now, customers can send any JSON format they want, including single JSON objects, JSON arrays, nested JSON objects/arrays, multiple JSON arrays, multi-content JSON, or any combination thereof. For more details on the JSON objects we support, visit documentation. We are excited about these new updates, but we are even more excited about what’s to come, so stay up to date on all things Time Series Insights by following us on Twitter. Our peers in the Big Data Group are also working on some interesting things as they build the world’s most powerful platform for data analytics at scale. Learn more about their big data journey on their website.